The connection between snails and diabetes may not be obvious, but the venom produced by predatory marine snails is giving University of Utah researchers new insights into the structure and function of insulin that could lead to the development of faster-acting treatments for diabetes in humans. The marine cone snail’s venom contains a form of insulin peptide, which disables the mollusc’s fish prey. Studies headed by the University of Utah’s Helena Safavi-Hemami, PhD, found that while insulin molecules produced by different species of cone snail lacked structurally and functionally critical parts of human insulin, they were still able to bind to and activate human, mouse and fish insulin receptors. In vivo tests showed that the snail insulins also lowered blood glucose in two preclinical models of induced diabetes. Insulin is a pancreatic hormone that is critical for maintaining glucose homeostasis. Lack of insulin secretion and/or insensitivity to insulin can lead to type 1 diabetes (T1D), which requires patients to inject themselves with insulin daily, or type 2 disease, which may also require regular insulin injections. The human insulin molecule consists of an A chain and a B chain that are connected by disulfide bonds. The structure naturally forms hexamers that are composed of clusters of six insulin dimers. But insulin is not active in this clustered form, and when injected subcutaneously the hexamer must dissociate into its constituent dimers, and then into monomers, before it can activate the insulin receptor. This means that injected insulin doesn’t start working immediately to control blood sugar. “… despite decades of research the best fast-acting insulin formulations are not truly monomeric and still require 15–90 min to effectively lower blood glucose,” the authors explained. This is because the part of the B chain that is involved in dimerization of the insulin molecule is also critically important for activating the insulin receptor, and scientists have struggled to develop an insulin without this part of the molecule, but which still works. “Until now, removing this region of the B chain in order to generate a fast-acting analog could not be achieved without a near complete loss of biological activity,” the team added. A marine mollusc is now proving valuable insights into how this problem might be solved. 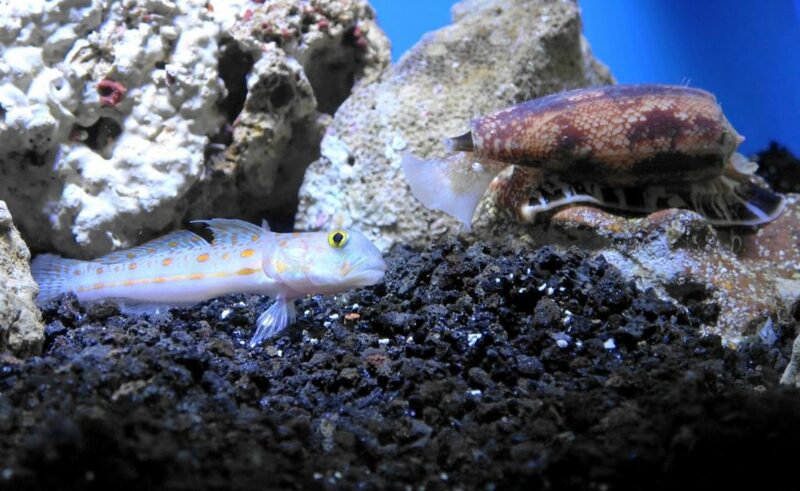 Back in 2015 Safavi-Hemami’s team discovered that venom produced by the fish-hunting cone snail Conus geographus contains an insulin peptide that lacks the critical region of the B chain that is responsible for insulin dimerization and human insulin receptor engagement, but is still able to activate the human insulin receptor. The cone snail sits in wait for prey to approach, and then releases insulin-containing toxic venom into the water. The insulin rapidly induces dangerously low blood sugar—known as insulin (or hypoglycemic) shock—in fish that come into contact with the venom. The prey are immobilized and the snail can emerge from its hiding place and engulf its meal. The University of Utah-led team’s newly reported research examined seven different insulin sequences found in the venom of three species of cone snail: Conus geographus, C. tulipa, and C. kinoshitai. The results, surprisingly, showed that while each species produced insulin molecules with slightly different structures, all were fast-acting because they lacked the B chain region. “Evolution may be the driving force to increase the molecular diversity of the toxin molecules that the cone snail species use for hunting prey,” said co-author Danny Hung-Chieh Chou, PhD, assistant professor of biochemistry at the University of Utah. Tests showed that the cone snail venom insulins activated the insulin receptors and lowered blood glucose levels in zebrafish and mouse models of chemically induced diabetes. Further analyses confirmed that although the venom insulin structures didn’t include the key B chain region that human insulin needs to bind to its receptor, they were nevertheless able to bind to the human insulin receptor and activate receptor signaling, albeit with lower potency than native human insulin. “Despite lacking this region, all seven venom insulins bind to and activate the hIR-B [B isoform of the human insulin receptor] and are capable of lowering blood glucose in a zebrafish model of T1D,” the authors stated. Interestingly, molecular dynamics data indicated that the cone snail insulins exhibited unique modes of action that are different from those of any other known natural insulins. Although the researchers’ studies focused on venom insulin produced by just three cone snail species, there are many hundreds of different species of the marine snail. It’s feasible that some of these may produce alternative venom insulins that have additional advantageous properties, such as better stability in blood, for example, which in combination with their faster action could help scientists design a new generation of therapeutic insulins.